As we mentioned in our article for AntiTint, iOS 6’s color changing status bars are a neat idea but they’re not to everyone’s tastes. AntiTint is a tweak, for the LimeRa1n-compatible devices which can run iOS 6 jailbroken, which disables the status bar tint effects. StatusColor is that tweak’s opposite; it enables iOS 6’s color changing tint effect in iOS 5. Tinted status bars in iOS 5. StatusColor works just like the tint effect in iOS 6 (except it can apply to even more apps, such as the default Music player). When a colored banner appears on the phone, StatusColor will take the average of that banner’s bottom row of colors and apply the result to the status bar’s color. The tint can take a moment to kick in, but the transition is fairly smooth. Given that apple’s SDK pushes developers to deliver a consistent user experience across the platform, you’re not going to see a lot of exotic status bar colors. Most of my apps deliver black, dull blues, and shades of grey. 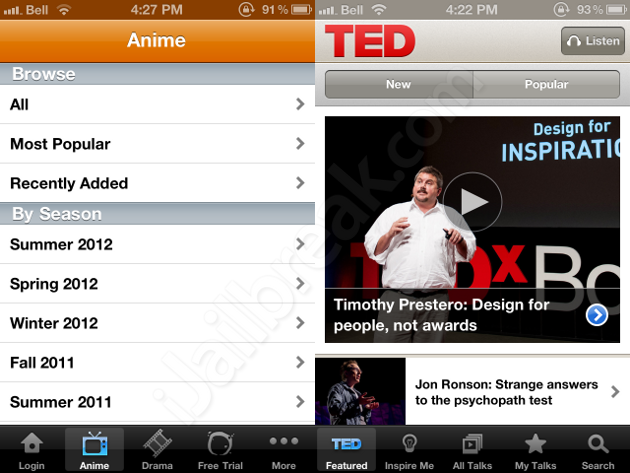 One of the exceptions I ran into is the anime streaming service CrunchyRoll, which causes the status bar to turn orange. Apps which have entirely non-standard banners have no effect on the status bar, such as the iPhone version of Netflix. StatusColor is a free tweak which is available in the BigBoss repository on Cydia. You can toggle whether you want StatusColor to affect default, translucent, or opaque status bars in the StatusColor Settings panel. Whether you prefer StatusColor or if you want to get rid of iOS 6’s tint effects with AntiTint is a matter of preference. Keep in mind that StatusColor does not work on the iPad. What do you think of the color tints? Share your thoughts in the comments section below.